Businesses are becoming concerned about water use and pollution reduction. Businesses are inspired by Green initiative and trying to incorporate more environmental friendly approach and technology for the business and manufacturing processes. 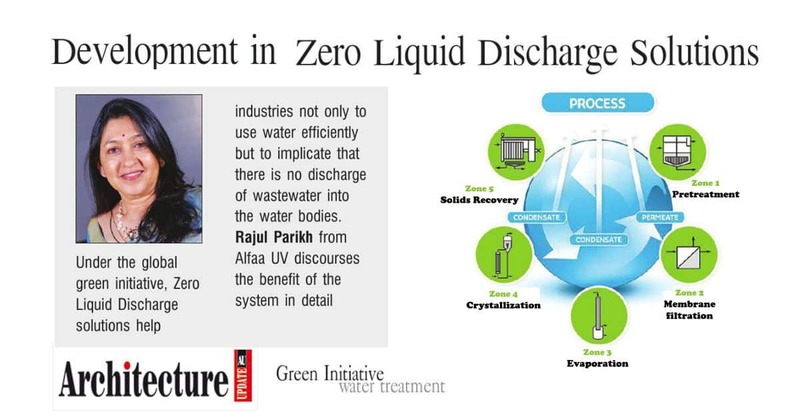 The objective of ZLD system is to recover and reuse all water and avoid any emissions and wastage of water. The ultimate goal of ZLD systems is to eliminate the discharge or disposal of liquid waste to the feasible extent. ZLD systems try not to discharge wastewater to surface water bodies by recycling, reusing or reducing the volume of waste streams (water based). Zero Liquid Discharge (ZLD) system process includes pretreatment, reverse osmosis, evaporation, crystallization and recovery. ZLD systems involve high capital and operating costs but factors like water scarcity, ground & surface water pollution, water economics, and regulatory pressure are the main drivers of ZLD in India. Read full article on Architecture Update. An intgilleent point of view, well expressed! Thanks!